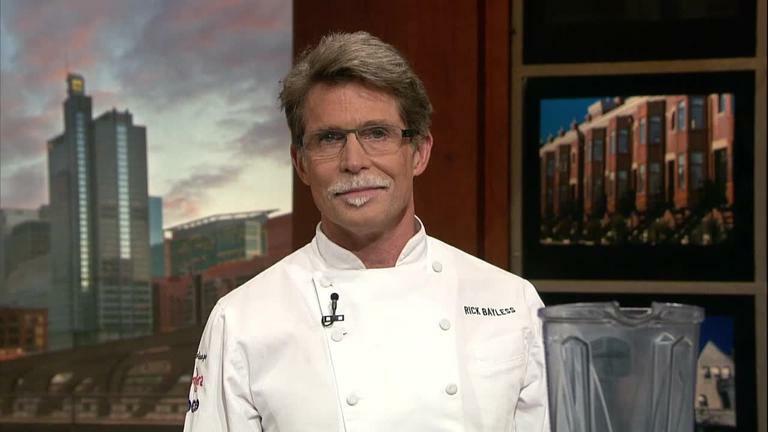 Rick Bayless is a pretty accomplished chef. I mean, aside from winning multiple James Beard awards (most impressive IMHO is the Humanitarian of the Year: 1998), winning Top Chef Masters in 2009 (did anyone else want to smack the taco out of Ludo Lefebvre’s vocabulary? ), and owning a restaurant named The BEST Mexican restaurant in America…well, he’s also got some amazing branded products that line nearly every grocery market’s shelves under the Frontera label (also named after his flagship restaurant Frontera Grill). And he’s a CHICAGOAN! Well, he’s a transplant from Oklahoma, but he still calls Chicago home and filmed portions of his series, Mexico: One Plate at at Time, from that Chi-town abode. In fact, that show is how my family and I became fans initially. We didn’t have cable TV (save the praise because we caved…but we’re jumping on the bandwagon shortly and cancelling), so we watched a lot of PBS and, voila, there he was. And he was the second man that my daughter, then 2, ever called handsome (her dad being #1). I didn’t blame her: he was cooking some of the most delicious-looking food and so darn chipper! He has a 1,000 watt smile to boot. Anyhow, because I think Mr. Bayless was the first chef I really started paying attention to, I have been using his recipes for quite some time. 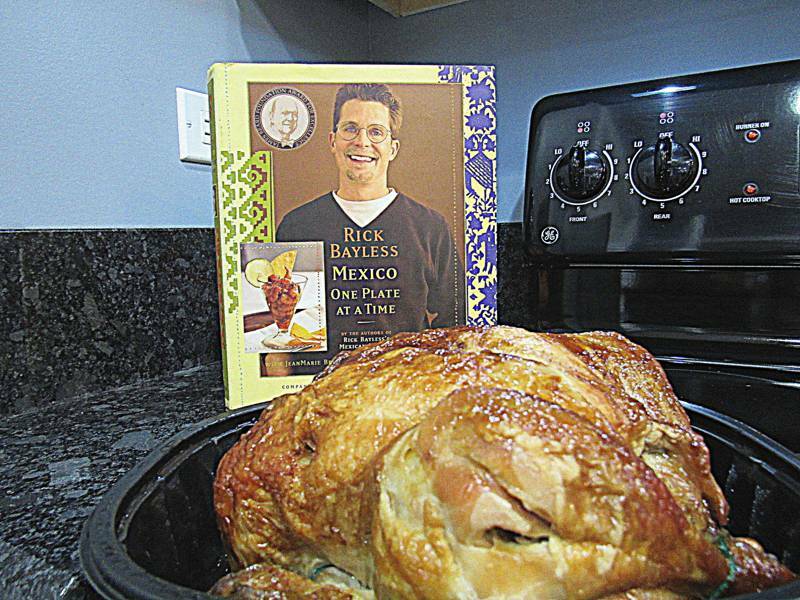 I own a couple of his amazing cookbooks, and I like to tackle one of the more time-intensive cooking projects once every few months. However, what do you do when you’re craving a Bayless creation and don’t have the time (read: energy) to do every. single. piece. from scratch? Well, I improvise, but the key is to keep the quality and integrity of the recipe in tact. So as my husband’s family traditions go, they make tamales for Christmas Eve every year. I know full well how much time is required for this project, and I also know how worthwhile that time spent is. Tamales=my favorite Mexican food. Why should I wait until the end of December to have some of my number ones? 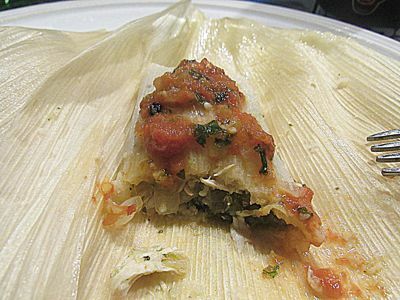 I have for you a simplified, faster, and yet nearly-identical-in-taste tamale, adapted from Rick Bayless’s Green Chile Chicken Tamales in his book Mexico: One Plate at a Time, that you will want to keep handy…they’re that good, and that easy. And, of course, they are gluten-free (one day my kiddo will love spicy food–in the meantime, I make a few cheese-only each time). 1. 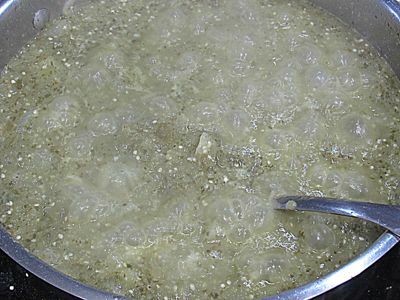 The corn husks need to soak in water for at least 4 hours, but overnight is fine also. If not, they are not pliable enough to fold after you fill them. 2. 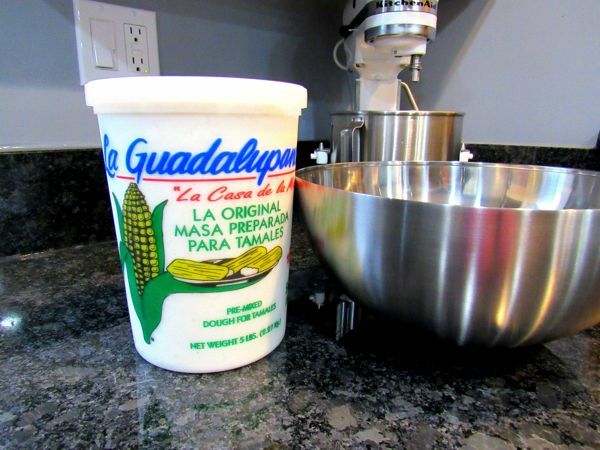 Remove the prepared masa (this is one of the biggest shortcuts) from the fridge at least 6 hours before using. 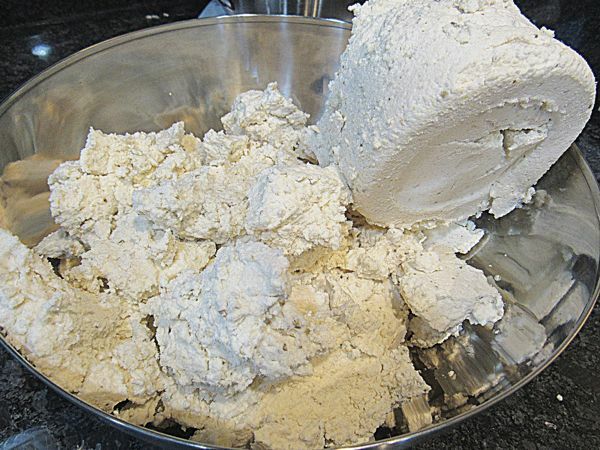 The fat that is in the mix will be so hardened that you will not have pliable masa to spread when you’re ready. *1 beautifully-roasted rotisserie chicken, shredded into pieces (removing skin, bones and cartilage). Chef Bayless actually signs off on this shortcut in his book! 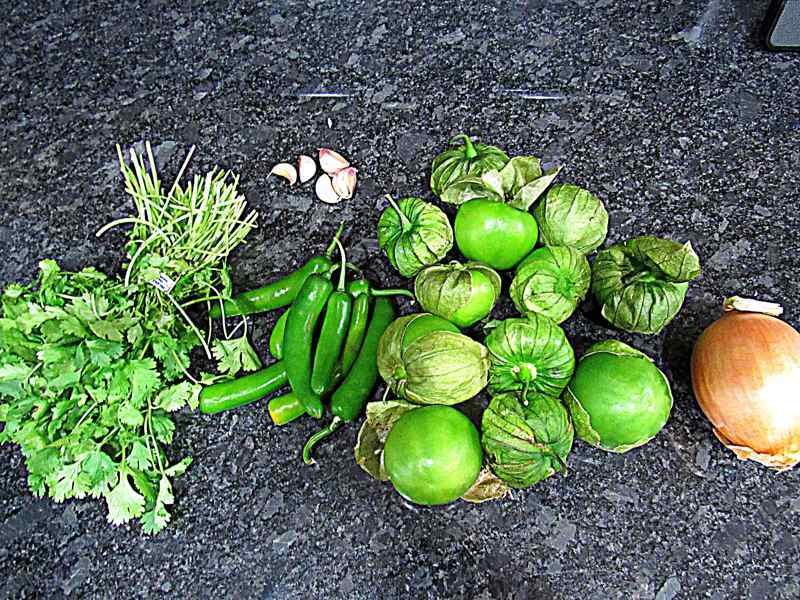 Next, put the tomatillos, garlic, chiles and cilantro into a food processor. If your processor can’t hold all of the ingredients at once, just do it in batches (I have to do this) and combine in bowl. Blend until you have a bright green purée. It’s okay if it has texture, but you really want something more like a purée than a pico de gallo consistency. 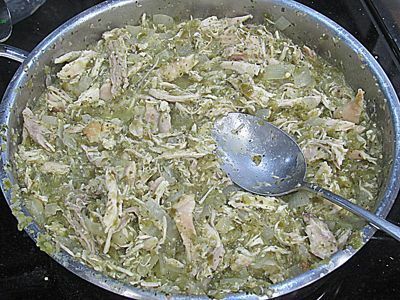 Add in the shredded chicken and keep on low until chicken is just heated through and set aside. Prepare the husks by choosing some that are not too narrow. Spread about 2 tablespoons (this depends on how big the husk is) with the back of a spoon evenly on the husk. You don’t want to see the husk through the masa layer, but you don’t want it to be too thick, either, and you want to be consistent (thicker masa will still be mushy if others are done). 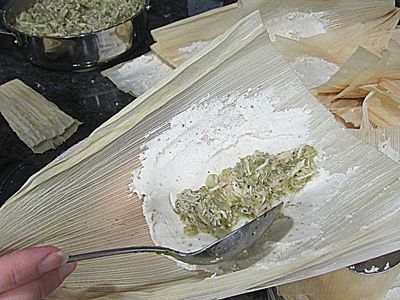 You want to be able to have at least a 2-inch width of masa spread so you can add enough filling in the center, fold the tamale and have that spread surround the filling. 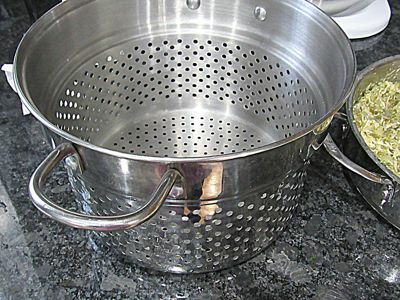 Now get your large pot with a steamer basket insert prepared by filling the pot until the water is just under the basket (you don’t want water actually touching the husks) and set it to boil. 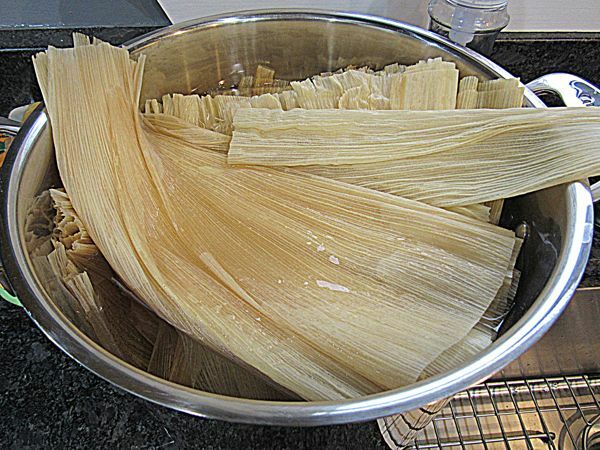 Leave the steamer OUT of the pot, though, as you’l need it cool when you place the tamales in. It’s time to fill and fold the husks. Put a spoonful of filling vertically down the center of the spread masa, leaving a margin all around. 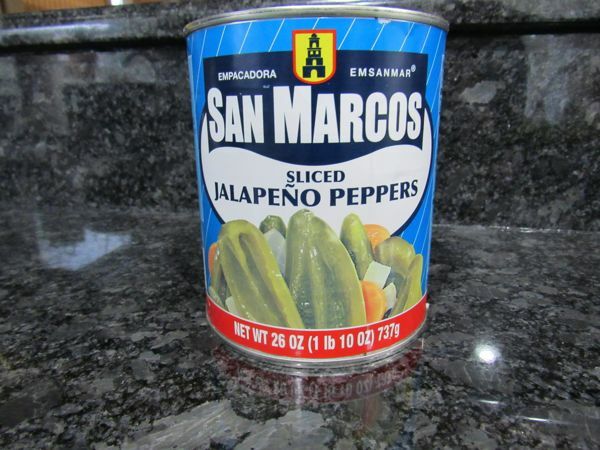 We like to add a sliced jalapeno or carrot (my favorite is carrot) from the can of pickled jalapenos I mentioned earlier. You fold them by bringing one side over the center, then the other, and flapping the bottom up towards the center. 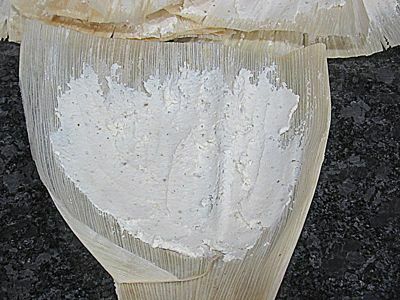 Some people peel a length of the husks they cannot use and tie the tamale closed with it. That’s very time consuming and not totally necessary (sometimes it’s done to differentiate if there are 2-3 different fillings made simultaneously). 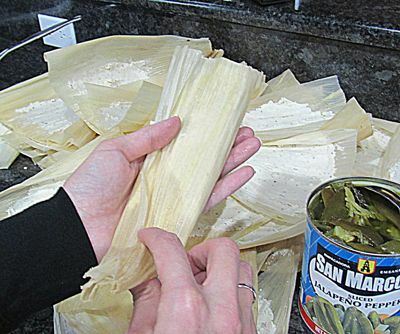 Set them with the closed-side-down in the steamer basket vertically (meaning they are standing upright, with the fold on the bottom, and you want the seam pressed firmly against the side of the basket or another tamale), holding them in place as you add one by one. Don’t worry, it’s hard to mess this up. Then, set the steamer into the pot and cover with a proper lid. My mother-in-law swears by putting a layer of foil under the lid, so I always do (you don’t question things like this because it just always “was”). Cook them for about 45 minutes, testing one by CAREFULLY (I say this from painful experience) by pulling one from the center of the pile out with tongs and unfolding it a bit. The masa should not be runny or liquidy…it should be solid. It’s okay if it appears to be a little soft; they just need to rest for a bit away from the steam. You don’t want baby-food looking masa, though. Look at this photo. The top-left shows how the masa is still gel-like. 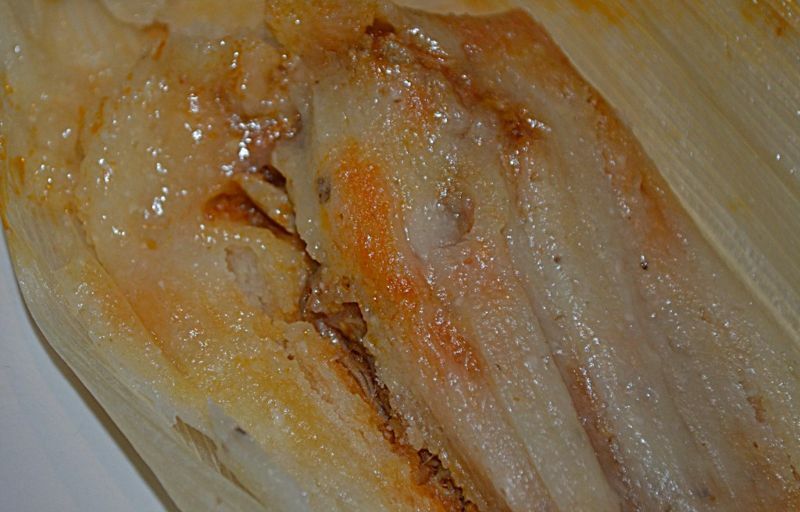 This tamale needs to be cooked about 5-10 minutes more. So they’re done. The next step is the quite critical, so pay attention: Count how many you are eating. Seriously, every single time I lose track and wind up eating my weight in tamales, which is not only bad for getting into my favorite jeans the next day, but it makes for grumpy family members because we have no leftovers. Leftover tamales are the BEST. If you have a cast-iron skillet, try reheating them out of the husk the next day….the masa gets nice and crispy and they are amazing. Or just reheat them in the microwave in their husks. You won’t lose either way. 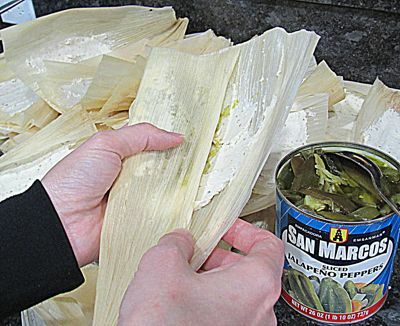 Any cooked or uncooked tamales should be stored in the fridge and used within a week, or you can freeze cooked or uncooked and enjoy later on as well. I topped ours with my homemade salsa, which you can find a recipe for here. 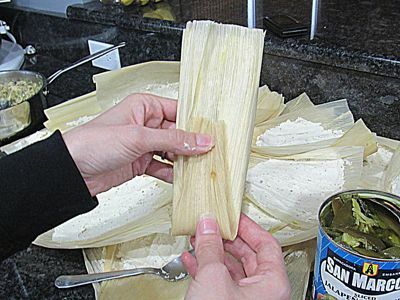 Loaded with short-cuts and flavor so you can enjoy traditional-style tamales without dreading the workload. Gluten-free to boot! Soak the corn husks in water. 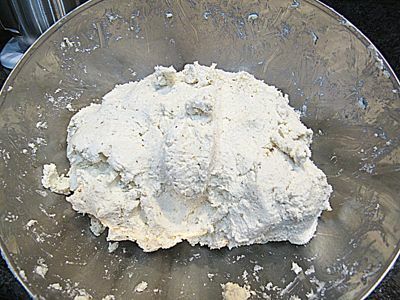 Scoop all of the masa into a large bowl and kneed and mix by hand until the texture turns from chunky to pasty. Next, put the tomatillos, garlic, chiles and cilantro into a food processor. 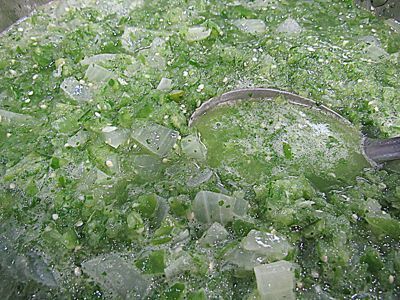 Blend until you have a bright green puree. Heat 2-3 tablespoons of oil (vegetable and canola work great) in a very deep skillet and heat onions until they are JUST translucent. Then add the green food processor mixture. Heat until the coloring turns from bright green to a darker brownish color. Add the chicken and heat until just warmed, then set aside. Next, prepare the husks: choose some that are not too narrow or thin. Spread about 2 tablespoons evenly over the center of the husk. Once you run out of masa or husks, get your pot ready: fill the bottom until the water is just under the steamer basket. Bring the water to a low boil. Begin putting the meat mixture down the center of the masa spread vertically in a line. If you're using the jalepenos, add one now. Fold the husk and set into the steamer bottom-side-down. Set the basket into the pot, cover with the lid and cook about 45 minutes. 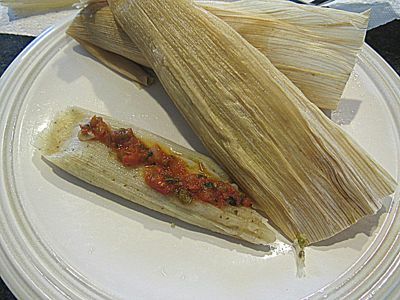 Test a tamale for firm masa and remove from heat if they are ready.